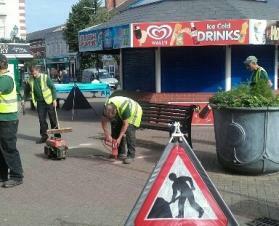 It is important to Skegness Town Council that all these items are well maintained in the most cost effective way possible, this is why the work is completed in house, by a small ground care team who also manage the Council's cemetery, burial ground, war memorial and allotments. This enables the Council to keep costs down, have control over the standards of care and schedule restoration and maintenance work for when it is most practical and suitable. The ground care team are responsible for completing a year round schedule of care and maintenance on all the street furniture this includes washing the bus shelters, emptying and cleaning the bins, labelling, cleaning and planting the planters and hanging baskets along with refurbishing and cleaning the notice boards. 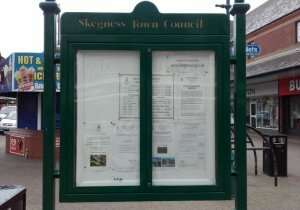 All five Skegness Town Council notice boards have recently been refurbished which included washing, repainting and in some cases replacing the actual board, compliments on the improved boards have already been received from both residents and Councillors. One of the biggest tasks for the Grounds team is managing the many benches around town, some of which have been kindly donated in memory of loved ones or by local organisations for the benefit of residents and visitors. Managing the benches includes siting new ones and bringing older benches into the workshop for restoration and maintenance work. Skegness Rotary Club have recently donated three benches which the ground team have just finished siting around the Town Centre. The benches are a mixture of concrete, metal, wood and resin. Whist the resin benches do not require much maintenance this is not true of the rest. It is Brian, who has worked for the Town Council for over ten years, who takes responsibility for maintaining the benches. The concrete benches are the most labour intensive to maintain as they have the Jolly Fisherman motif on the ends, Brian takes great pride in re-moulding and hand painting the Jolly Fisherman motif on the ends along with replacing any damaged slats and re-painting the bench. Once a bench has been in the workshop for a few days it comes out looking as good as new! Whilst the Ground Team complete most of the work associated with Street Furniture it does not end there, it is down to the staff in the office to deal with all street furniture enquires, order any new or replacement street furniture, organise and maintain the waste carriers license, keep an up to date inventory of all items, liaise with highways on acceptable locations for new benches and arrange repair of damaged bus shelters. It is also important that any high value street furniture items are included on the Council insurance. As with a lot of Council responsibilities there is more involved than at first you may think.